Write XAML to change the UI on your start page. 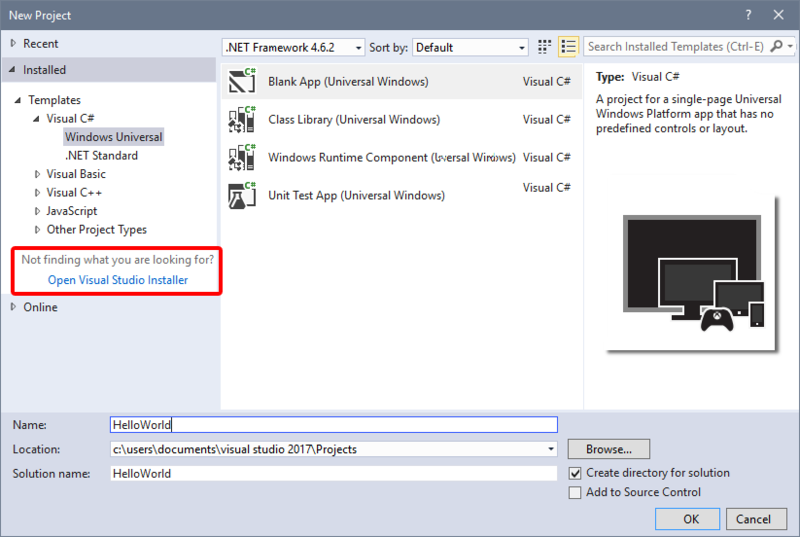 Run the project on the local desktop in Visual Studio. Use a SpeechSynthesizer to make the app talk when you press a button. 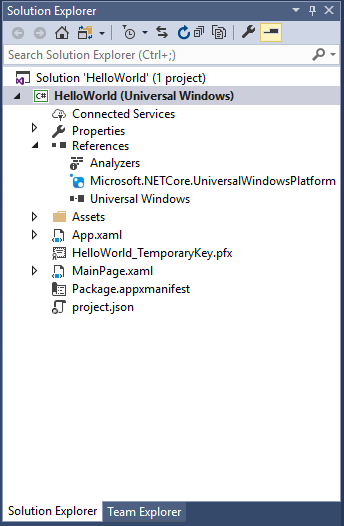 What's a Universal Windows app? Download Visual Studio 2017 (and Windows 10). If you need a hand, learn how to get set up. From the File menu, select New > Project to open the New Project dialog. From the list of templates on the left, choose Installed > Visual C# > Windows Universal to see the list of UWP project templates. Although the Blank App (Universal Window) is a minimal template, it still contains a lot of files. These files are essential to all UWP apps using C#. Every project that you create in Visual Studio contains them. To view and edit a file in your project, double-click the file in the Solution Explorer. Expand a XAML file just like a folder to see its associated code file. XAML files open in a split view that shows both the design surface and the XAML editor. What is XAML? Extensible Application Markup Language (XAML) is the language used to define your app's user interface. 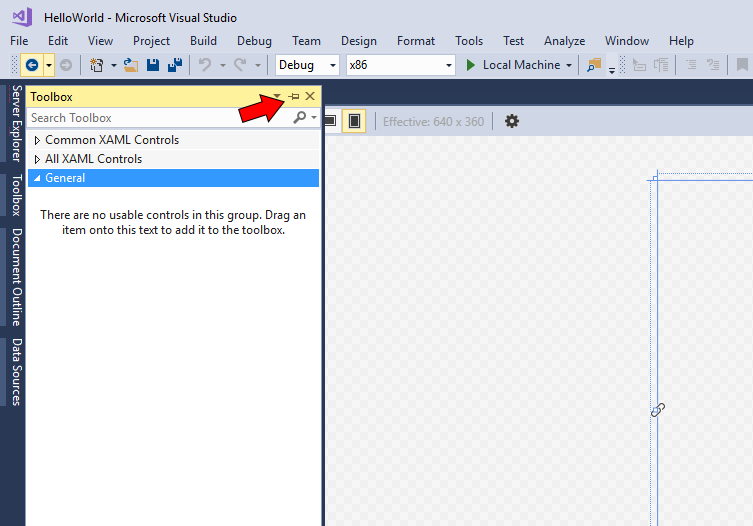 It can be entered manually, or created using the Visual Studio design tools. A .xaml file has a .xaml.cs code-behind file which contains the logic. Together, the XAML and code-behind make a complete class. For more information, see XAML overview. App.xaml is where you declare resources that are used across the app. App.xaml.cs is the code-behind file for App.xaml. Like all code-behind pages, it contains a constructor that calls the InitializeComponent method. You don't write the InitializeComponent method. It's generated by Visual Studio, and its main purpose is to initialize the elements declared in the XAML file. 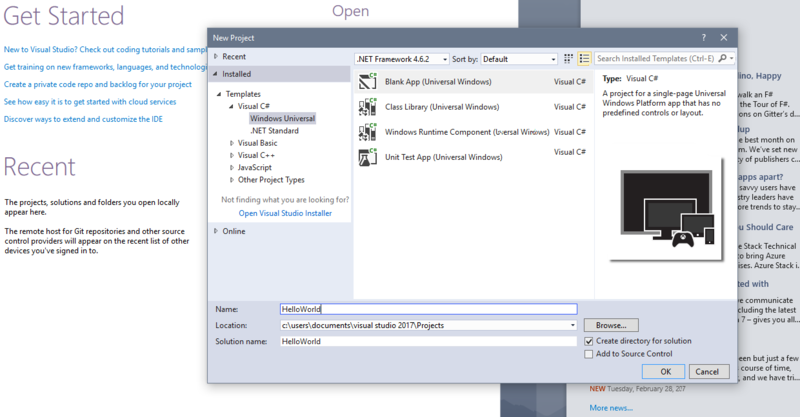 App.xaml.cs is the entry point for your app. App.xaml.cs also contains methods to handle activation and suspension of the app. MainPage.xaml is where you define the UI for your app. 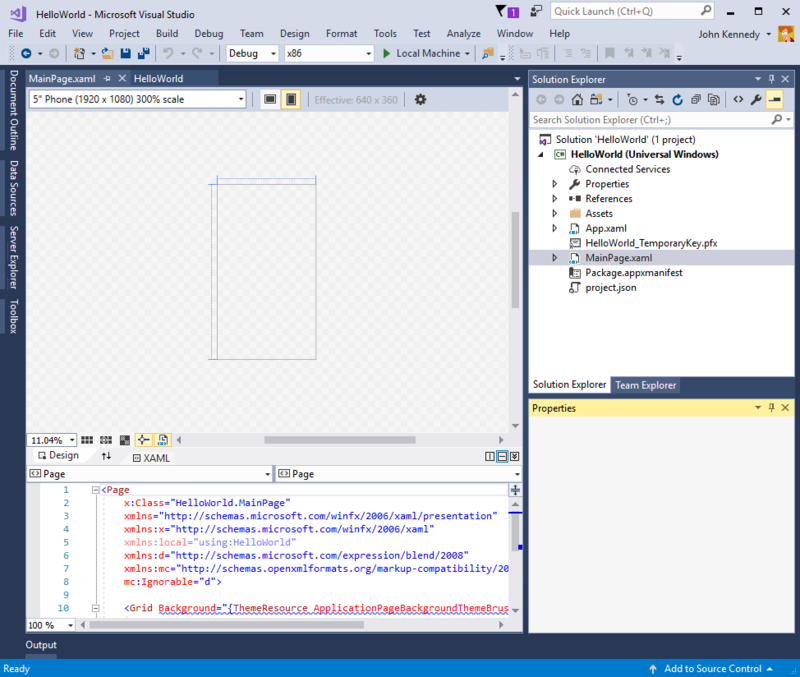 You can add elements directly using XAML markup, or you can use the design tools provided by Visual Studio. MainPage.xaml.cs is the code-behind page for MainPage.xaml. It's where you add your app logic and event handlers. Together these two files define a new class called MainPage, which inherits from Page, in the HelloWorld namespace. A manifest file that describes your app: its name, description, tile, start page, etc. Includes a list of dependencies, resources and files that your app contains. Assets/Square150x150Logo.scale-200.png and Wide310x150Logo.scale-200.png represent your app (either Medium or Wide size) in the start menu. Assets/Square44x44Logo.png represents your app in the app list of the start menu, task bar and task manager. Assets/LockScreenLogo.scale-200.png can be used to represent the app on the lock screen, when the system is locked. Let's add a button to our page. In this tutorial, you work with just a few of the files listed previously: App.xaml, MainPage.xaml, and MainPage.xaml.cs. Double-click on MainPage.xaml to open it in the Design view. You'll notice there is a graphical view on the top part of the screen, and the XAML code view underneath. You can make changes to either, but for now we'll use the graphical view. 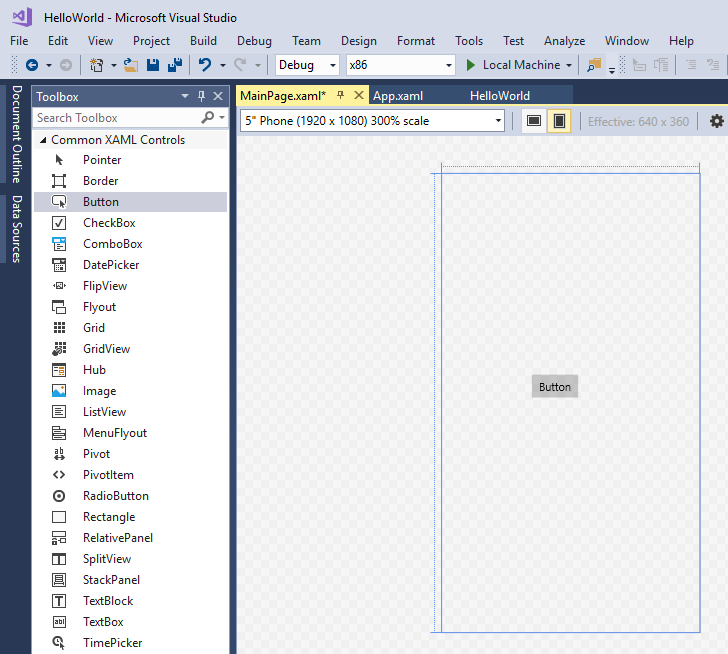 Expand Common XAML Controls, and drag the Button out to the middle of the design canvas. 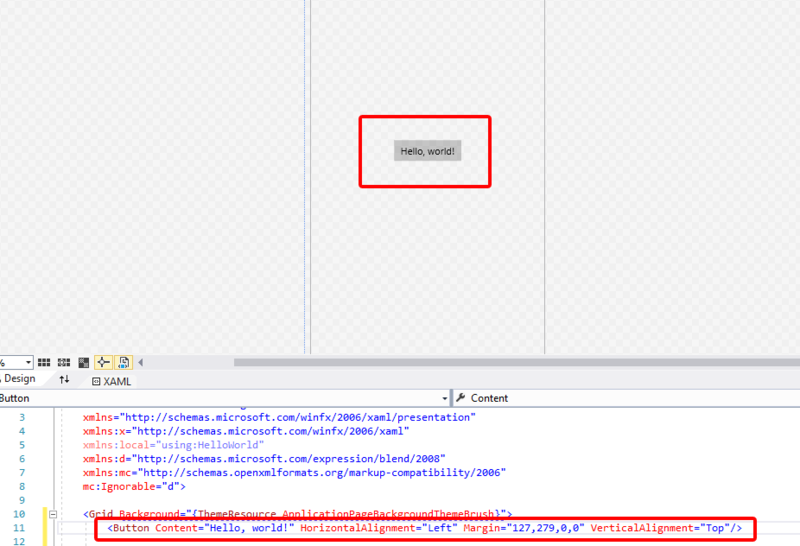 Click in the XAML code view, and change the Content from "Button" to "Hello, world!". Notice how the button displayed in the design canvas updates to display the new text. At this point, you've created a very simple app. This is a good time to build, deploy, and launch your app and see what it looks like. 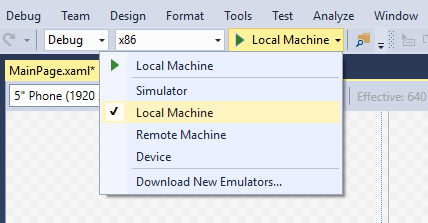 You can debug your app on the local machine, in a simulator or emulator, or on a remote device. Here's the target device menu in Visual Studio. By default, the app runs on the local machine. 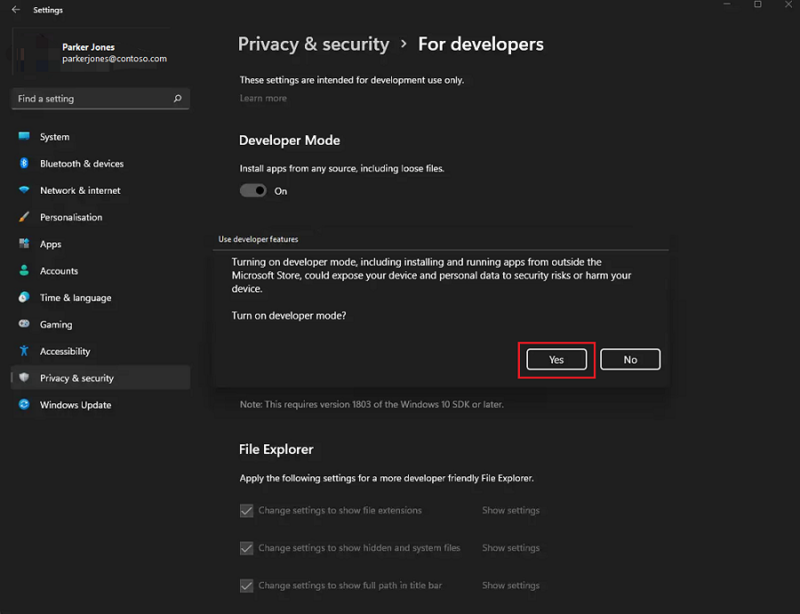 The target device menu provides several options for debugging your app on devices from the desktop device family. Click the Start Debugging button ( ) on the toolbar. The app opens in a window, and a default splash screen appears first. The splash screen is defined by an image (SplashScreen.png) and a background color (specified in your app's manifest file). The splash screen disappears, and then your app appears. It looks like this. Press the Windows key to open the Start menu, then show all apps. Notice that deploying the app locally adds its tile to the Start menu. To run the app again later (not in debugging mode), tap or click its tile in the Start menu. 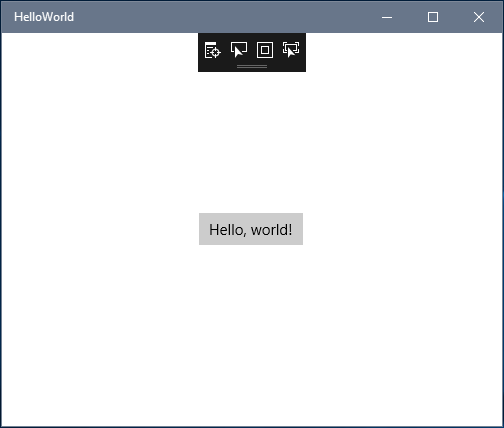 It doesn't do much—yet—but congratulations, you've built your first UWP app! Click the Stop Debugging button ( ) in the toolbar. From the Debug menu, click Stop debugging. An "event handler" sounds complicated, but it's just another name for the code that is called when an event happens (such as the user clicking on your button). Stop the app from running, if you haven't already. You can of course, create all the code manually too. Or you can click on the button to select it, and look in the Properties pane on the lower right. If you switch to Events (the little lightning bolt) you can add the name of your event handler. Make sure the method signature now includes the async keyword, or you'll get an error when you try to run the app. When you run the app and click on the button, your computer (or phone) will literally say "Hello, World!". Congratulations, you've created your first app for Windows 10 and the UWP! To learn how to use XAML for laying out the controls your app will use, try the grid tutorial, or jump straight to next steps?